Okay, I didn't literally grow up on the back of a quarter horse, but let's just say I spent much of my childhood, when I wasn't at the library or reading a book, at the barn with my dad. He was the real deal, a Texas cowboy raised in a rural town called La Grange not far from Houston, Texas. My grandfather worked at the local auction house and my dad grew up working with animals. My sister told me something about him recently that I did not know; my dad was known for raising orphaned and sick animals. Anyone around who had an orphaned calf, lamb, or piglet gave it to my dad to hand-raise. No wonder I love animals; it's in my genes! My first horse was a fuzzy red pony named Miss Prince. 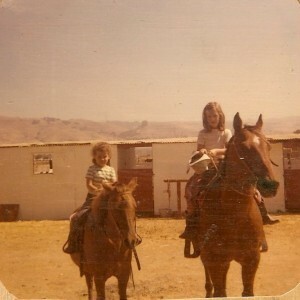 My sister, Sara, is riding her in the photo to the right. We noticed Miss Prince was chunky and getting larger every day. My dad kept cutting down on her feed, to no avail. One morning we got a phone call from Mr. Wilson, the ranch manager. "You better come down here. There's something you need to see." When we showed up, we got the surprise of our lives. Miss Prince hadn't been overeating; she had been pregnant! In the middle of the night she had given birth to a fuzzy little colt, red just like her. My sister and I were ecstatic. We named him Red Baron. I could mark the history of my childhood by the horses we had. Our family favorite was Y-bar, a beautiful bulldog quarter horse, from an Idaho ranch, out of Three Bars. We adored him and he became a family pet. He was a bay, a rich red with a glossy black mane and tail. He adjusted his personality to whoever was riding. For my dad, he became a rip-snorting stallion, dancing and fiery. For me, he was quiet and responsive, doing whatever I asked. For my mom, who was scared of horses, he walked slowly and moved carefully (she still fell off him once, though). My favorite horse of all time was Harry, a gorgeous and athletic black Morgan/Arab cross. He was intelligent, feisty, affectionate, and always took care of his rider. Once we had a tiny foal on the property, a highly bred quarter horse filly. An obnoxious Paint horse took a dislike to her and kept trying to attack her like she wanted to kill the baby. Harry, my hero, put himself between the baby and her attacker. He bared his teeth and kept the aggressive horse away for hours until she was whisked away to safety in a different pasture. Not long ago, my daughter and I volunteered at a place that puts at risk kids and children with disabilities on horses in a therapeutic riding program. Sonrise Equestrian Foundation is the brainchild of Melanie Buerke and Alana Koski. As I watched the kids learn bond with the horses and come out of their shells, I was reminded of the blessings of a childhood spent on horseback and the lessons I learned. Horses are in my blood. You can put me in a dress and heels, but I'll always be a cowgirl, at home in a barn with dusty boots and alfalfa in my hair. Yee-haw!